Noting that advancements have been made in the talks on civil nuclear deal with the US, India has said "certain" aspects have to be sorted out but there is no certainty of the final agreement coming through this year. "Some advancements have been made," External Affairs Minister Pranab Mukherjee has said on the talks over 123 agreement that will operationalise the civil nuclear deal. "There are certain areas which have to be sorted out," he told the Straits Times newspaper ahead of his two-day visit here from tomorrow. Mukherjee said the nuclear issue was "very briefly" raised when Prime Minister Manmohan Singh met US President George W Bush in Germany earlier this month. Maintaining that both India and the US are seriously trying to sort out the "outstanding issues", he, however, refused to specify when the agreement will be firmed up. "I cannot say it can be possibly done this year. We are trying," he told the newspaper. The year-long negotiations on 123 agreement have failed to yield any breakthrough due to differences on some aspects, particularly reprocessing. While India wants the right to reprocess spent nuclear fuel, the US is reluctant to allow it. To break the logjam, India recently offered to set up a dedicated facility for reprocessing under safeguards. Asked if it would be done during the tenure of the Bush administration, Mukherjee said the present government's term and "our tenure (which ends in May 2009) are almost synchronised". 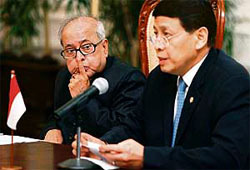 When referred to reports of chill in India-China relations recently, Mukherjee said the ties between the two neighbours were warm and not "cold". There are problems regarding demarcation of the boundary, the External Affairs Minister said, adding that is why Special Representatives of the two countries have been talking. "It cannot be sorted out overnight," he said. The two countries have signed an agreement on Guiding Principles and Political Parameters. The minister said confidence-building measures were being taken and there had been substantial reduction in tensions on the border. Noting that Sikkim was a problem for over 30 years, he said China has now accepted it as part of India.